The first shot of a new war echoes through the galaxy. Craze has high hopes for what the alliance with an old enemy, the Foreworlds, will do to defeat a worse enemy, the Quassers. The test of a highly-advanced weapon, created by the efforts of the alliance, pushes tensions over the brink and kills thousands. To make it worse, the Foreworld ambassador is keeping secrets. Conventional warfare against the Quassers isn’t working, and if the alliance ends, Craze has become the most hated man in the galaxy for no reason. With nothing left to lose, Craze sets in motion one last chance for survival. How much would you sacrifice to save your friends, your home, and your way of life? 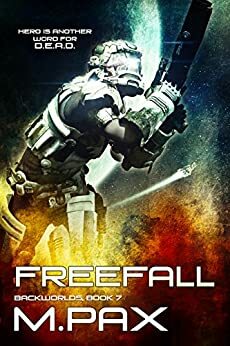 Would you sacrifice your pride, your job, your home, and possibly even the friendship of those closest to you, if that meant saving them from certain death by an alien race? These are choices that Craze and his friends face in Freefall, Backworlds #7 by M Pax, and the author keeps the tension ratcheted up to an eleven with new twists and turns, relationships in turmoil, and action-packed scenes that leave a reader glued to the page/screen. Character-driven but action-filled, the Backworlds series always keeps me engaged with its fresh perspectives on alien life forms, cultures, and an in-depth look at what it means to be both sentient and caring. Not everyone is strong enough to stand for what’s right, no matter the cost. Not everyone wants to. Trust is a tough commodity in a universe filled with strangers and double-crossing family members. Friends are the only thing Craze has to rely on, but in Freefall, he is faced with the prospect of losing them as he works with an alliance of former enemies to deal with an even greater threat. Fans of Firefly and Farscape will enjoy this sci-fi series. It’s a worthwhile ride. 5.0 out of 5 starsBook 7, there will be an 8. So, we are at book 7 in this series. If you've read the previous six books frankly you don't need to know about the author's writing. You probably enjoy it as well. Nothing has really changed between this book and the previous. The plot continues, and apparently it will continue past this one. So be ready for that. If you found this book and didn't realize it's a series. You owe it to yourself to look into the series. The writing is easy to read and makes for a fast read. Each book is fairly short so it's not a massive commitment. Frankly that's probably my biggest complaint about the series is the books are a bit too short. As you read them you definitely become interested in the characters and want to hear more about them. The plot continues through each book seamlessly and you will find yourself wanting to just keep reading. The Backworlds and Foreworlds have banned together with the hope of defeating a terrifying enemy, the Quassers. Craze gave up his friends and livelihood to become the envoy for the Backworlds. All he'd rather be doing is brewing some malt and tending his bar, but there is much more than his pride at stake here. The alliance is shaky, and Craze can't afford to let it fall apart. They have one more chance at survival, and it's all or nothing. I loved delving back into the rich universe of this space opera series. The settings, characters, and storylines are all marvelously varied, but twine together so very well. I'm often reminded of Firefly with Craze and his friends out to save the universe armed with their good hearts and sometimes good luck. But things don't go their way all the time. The cast in this series is large, but none of them suffer from lack of depth. Each of them have their own tales, but a powerful love of friends holds them together. The twists in the plot had me shouting "Oh my God!" out loud, and several times, it tugged hard at my heart. Plus there were some clever bits in there like the crusties and the tendrils. This is an immensely heavy book, and I didn't want it to end. I'm eagerly awaiting the next installment in the Backworlds. 5.0 out of 5 starsOne of the more imaginative works of sci fi I've read in years! I highly recommend that you read the series. It must be read in order and don't skim too much. Highly recommended fast-paced SF saga that keeps you locked in and wanting more and more. Loveable characters, lasting friendships, and great storyline. 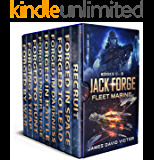 Loads and loads of entertainment in this series for SF fans and many others.